If you haven't heard already, I'm sorry guys. Legend of Hao Lan or Beauty Hao Lan 皓澜传 which was supposed to premiere on iQiYi this Thursday has been postponed. The announcement was made last night, "Due to schedule adjustments, Hao Lan Zhuan's Nov. 15 premiere has been postponed. The new broadcast date will be announced separately. The press conference scheduled on Nov. 13 has also been cancelled. Thank you for your attention"
The reason that was given sounds like your standard issue statement, and as usual, people are formulating their own hunches with censorship being one of the suspects. Unlike Story of Yanxi Palace, Legend of Hao Lan seems less focused on romance and instead tells the story of Li Hao Lan, a rather flawed character in history. Separately, there are also reports that someone from iQiYi has attributed the delay to production issues. I guess we'll never know what the real reason is. 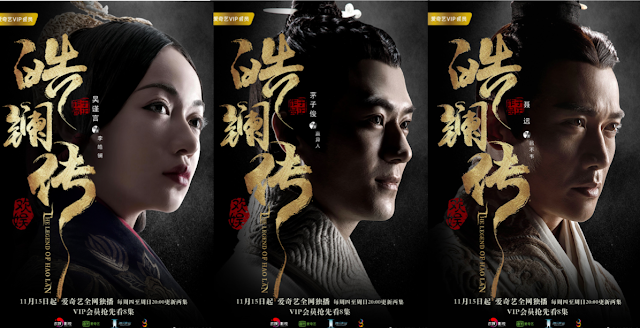 Legend fo Hao Lan led by Wu Jinyan, Mao Zijun and Nie Yuan was highly-anticipated because of Story of Yanxi Palace. The hype from the hit drama still lingers, and I wish they'd air this soon.